The mezzo-soprano Claudia Eder already performed at opera houses in Wiesbaden, Düsseldorf, and Vienna and at major concert stages around the world. 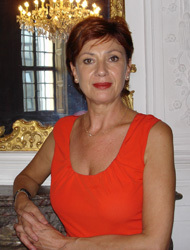 She has been professor of vocal studies at the Mainz School of Music since 1988. She was the first female artist to win the Academy Prize of the State Rhineland-Palatinate and is an appointed member of the Academy of Sciences and Literature Mainz, and the European Academy of Sciences and Arts at Salzburg. Eder has initiated several very successful programs in Mainz, such as the "Junges Ensemble", a cooperation of JGU with the Mainz State Theater, and the continuing education program "Barock vokal – Kolleg für Alte Musik".